with Paisnel Gallery, London, where purchased by the present owner. 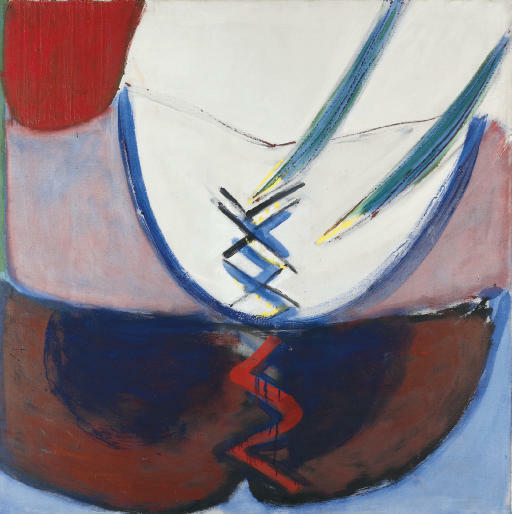 London, Belgrave Gallery, Terry Frost, October - November 1989, no. 20. In the early 1960s Terry Frost introduced semicircles and lacing into his work. In an interview with David Lewis years later, he explained that a drawing of his wife was the inspiration for this, 'I made a drawing of Kath from behind ... and there were these two buttocks coming in from the side of the paper with the crisscross of the lacing of her bathing suit, tied in a bow ... and that simple drawing had a lot of meanings for me. And then when I looked at those semicircular shapes in the drawing my mind went back to the boats' (C. Stephens, Terry Frost, London, 2000, p. 52). Frost acknowledges the similarities between the shape of the female body and the curve of boats, and so unites various iconic images that are repeated in his work. with Belgrave Gallery, London, October 1989.